Treat your special ones by ordering online this Ever Delightful Diwali Celebration Gift Hamper for them and show how special a place they hold in your heart. 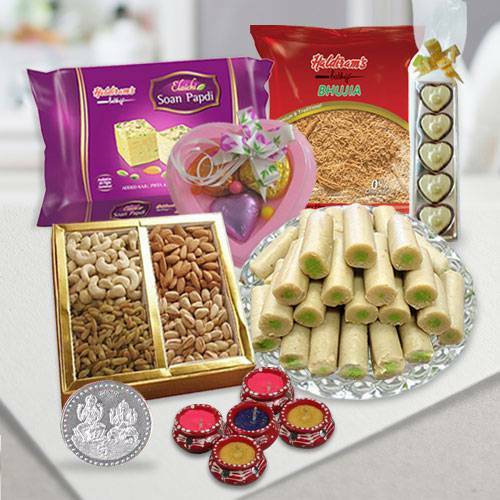 This festive collection include variety of items like Haldirams Kaju Pista Roll (Gross Weight - 250 g), Haldirams Bhujia (Gross Weight - 250 g), Haldirams Soan Papdi (Gross Weight - 250 g), Assorted Dry Fruits (Gross Weight - 250 g), Handmade Chocolates (5 Pc), Handmade Chocolates in Heart Shape Box (3 Pc), Diyas (5 Pc) along with a complimentary Laxmi Ganesh Silver Plated Coin, all presented in a beautiful Basket. Note: Depending on availability Basket design may vary.